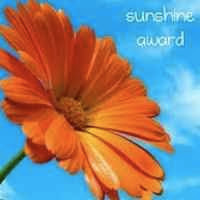 It's Wildflower Wednesday, and of course there are no wildflowers blooming in my USDA zone 5a garden in January. 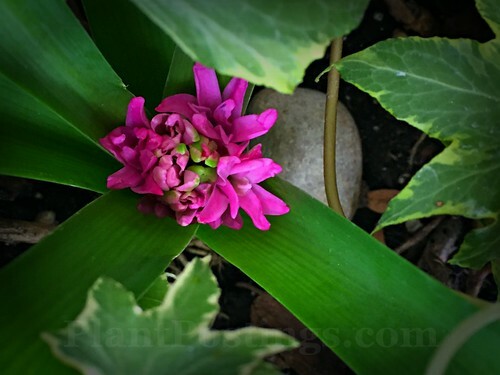 In fact, this plant has never bloomed in my garden. 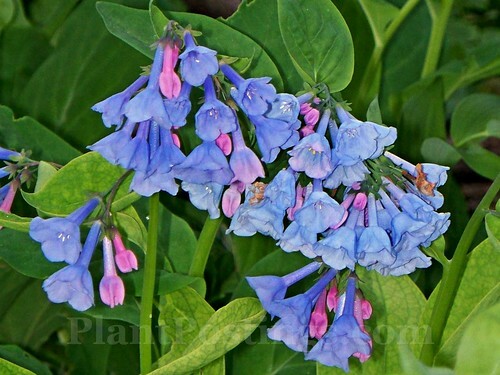 I planted Virginia Bluebells (Mertensia virginica) from seed in the fall of 2013. Every year, I find more plants along the edge of our little woodland, but after five years, they haven't bloomed. Perhaps the rabbits are eating the tiny buds before they have a chance to flower, though I've read it's a rabbit-resistant plant. I won't give up, because I'm hoping eventually they'll colonize among the Trilliums, Bloodroot, Spring Beauties, and the other spring ephemerals. 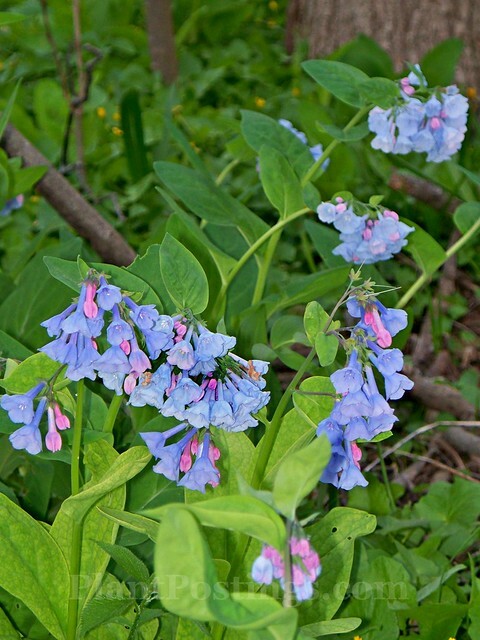 Virginia Bluebells are native here, and I've seen them many times in nearby forests, parks, and nature centers. Virginia Bluebells are native to much of eastern North America--from Maine and Georgia westward through Minnesota and Kansas, according to the Lady Bird Johnson Wildflower Center. 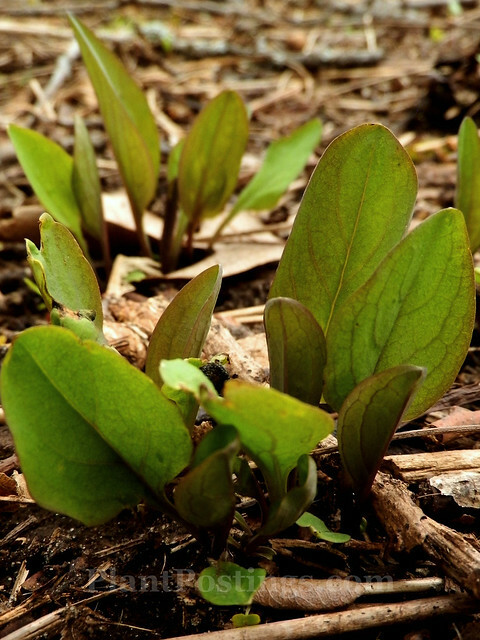 The plants emerge in early spring, and often have a slight reddish tinge to the foliage until they grow larger. Maximum height is about two feet. 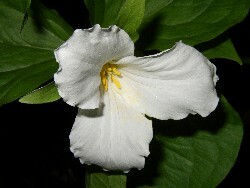 In the wild, they grow in moist woods and clearings and along river edges. 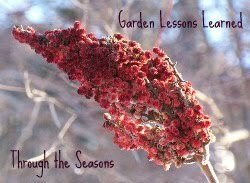 They prefer part shade or full shade and rich soil. Buds begin pink and open to an exquisite blue, for which photos simply can't do justice. 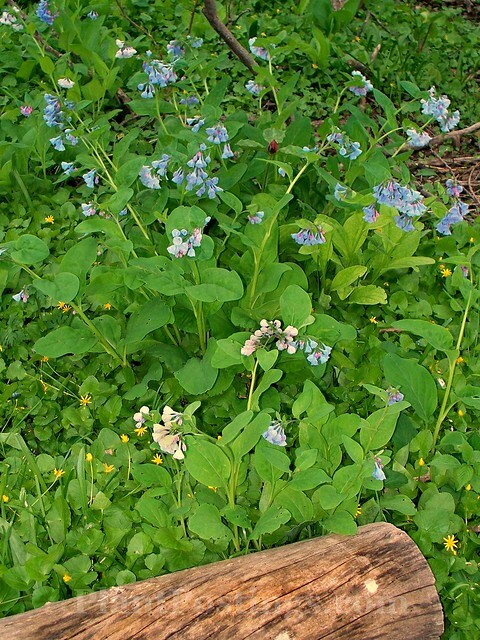 Will this be the year Virginia Bluebells bloom in my woodland garden? Time will tell. Until then, I'll dream about them and look forward to seeing them somewhere nearby as winter fades to spring. 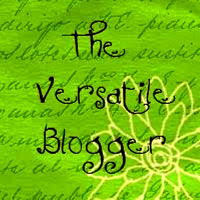 I'm linking this post to Gail's Wildflower Wednesday meme at Clay and Limestone. 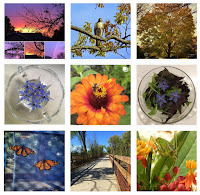 Head on over to learn about other wildflowers in gardens and wild places around the world. 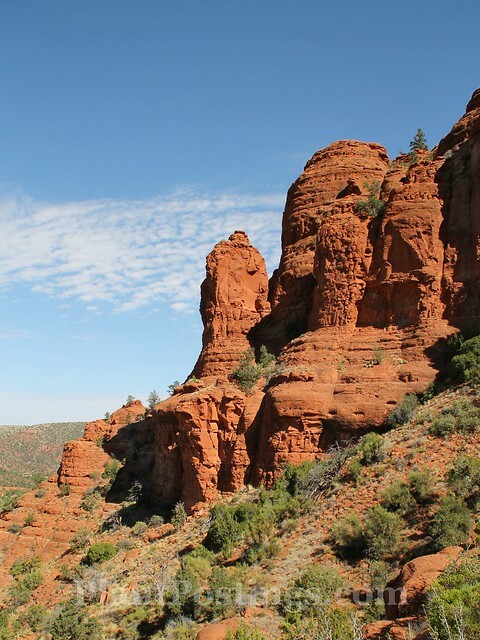 If you only have one day or a few hours to explore Sedona, Arizona, it won't be enough. But do it anyway: The memories will warm your soul on a cold winter's day. 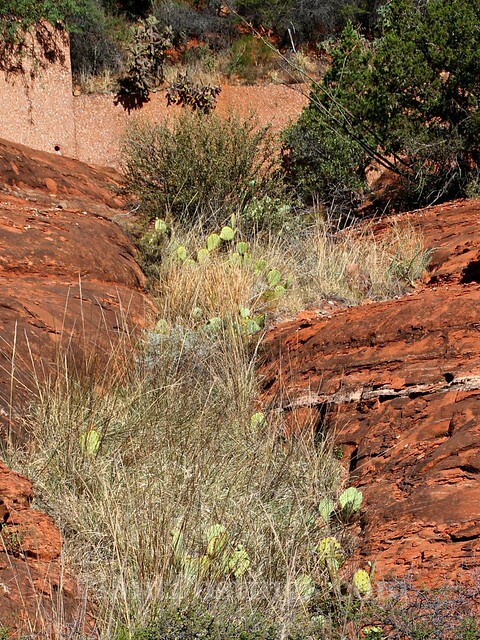 Red Rock Country is visually stunning and other-worldy. 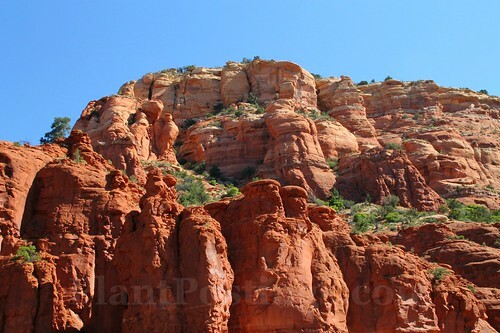 Apparently the rocks are red because of the area's hematite (iron oxide) that stained the sandstone. 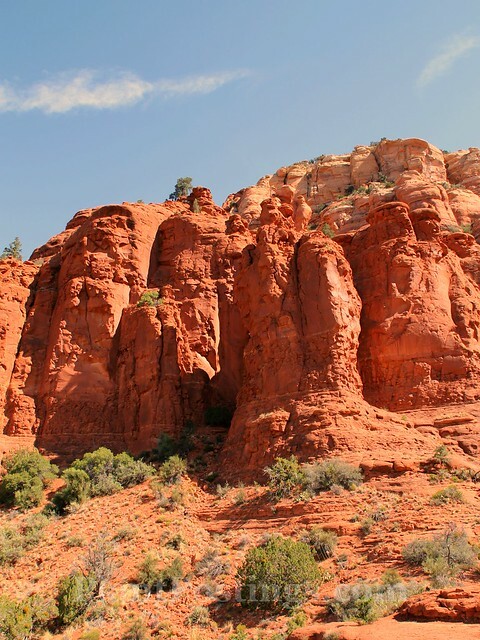 The rock formations were formed over millions of years, through water flows, erosion, wind, and other forces, and they're always changing. 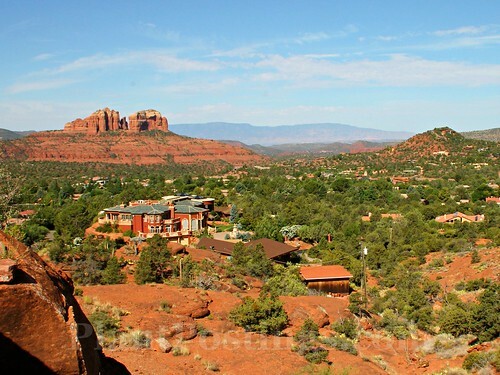 There's a story behind this sprawling estate surrounded by picturesque rock formations. Some think it's fabulous, while others consider it an eyesore. By Matthew P. Del Buono (Own work) [CC BY-SA 3.0 (https://creativecommons.org/licenses/by-sa/3.0)], via Wikimedia Commons. 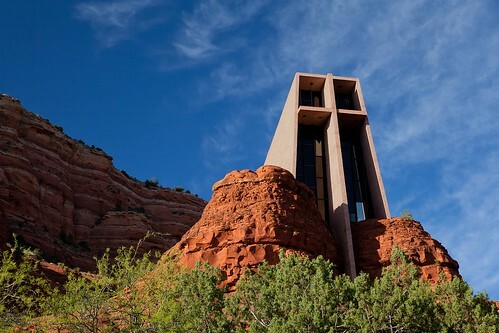 https://commons.wikimedia.org/w/index.phptitle=File:Chapel_of_the_Holy_Cross,_Sedona,_AZ.jpg&oldid=123792338 (accessed January 14, 2018). 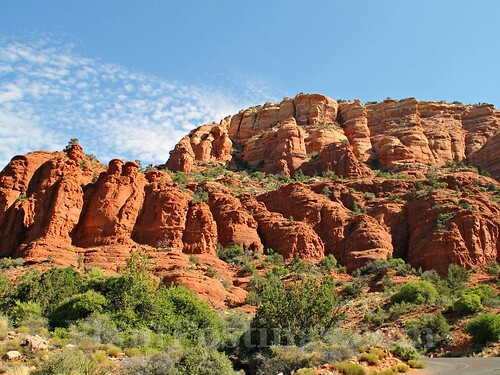 When we were in Sedona, we spent a good portion of the day at the Chapel of the Holy Cross. 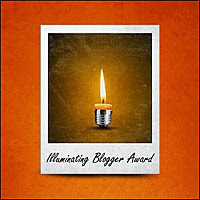 You can see photos of the inside of the church here. It's on the National Register of Historic Places. I didn't take any photos of the church, but I snapped several of the surrounding landscape, plants, wildlife, and the more modest features of the property. 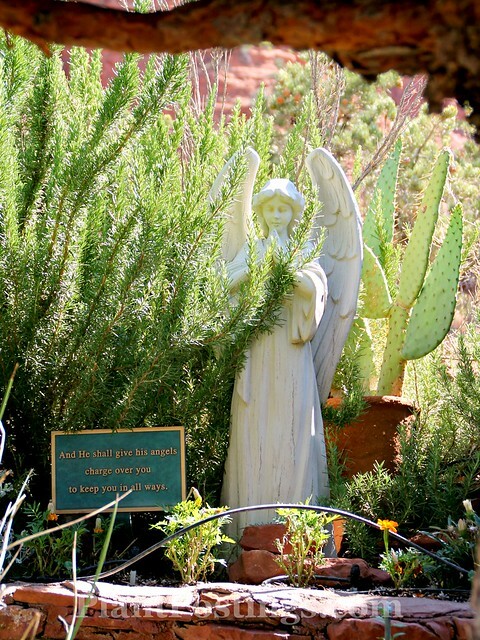 This little angel statue is part of a garden display, along the trail leading up to the chapel. It's very peaceful. 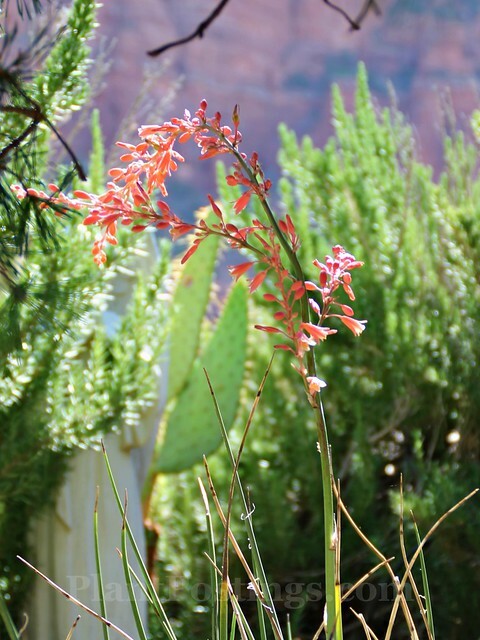 One of the featured plants: a Red Yucca (Hesperaloe parviflora). 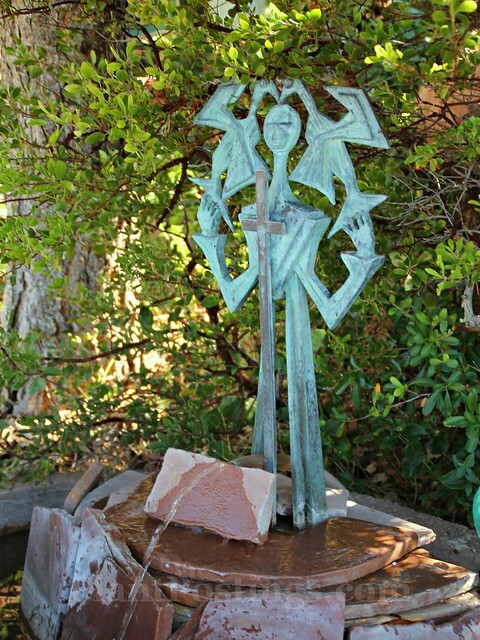 I love this St. Francis fountain--a calming presence, surrounded by plants and moving water. 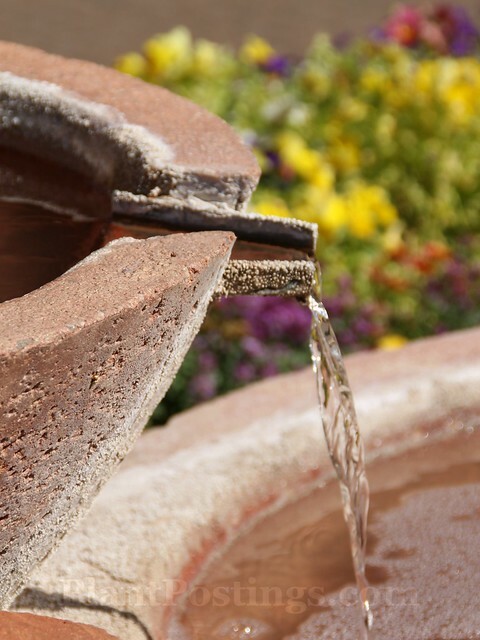 Other fountains and simple structures decorate the area adjacent to the chapel. 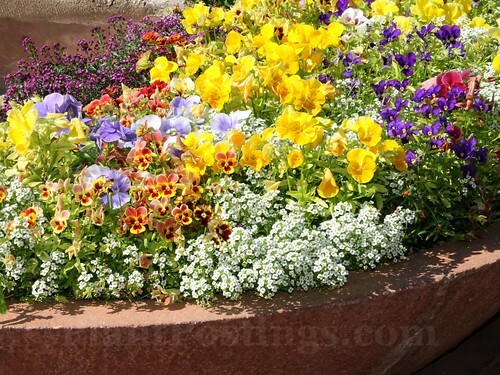 Large planters are filled with colorful annuals. 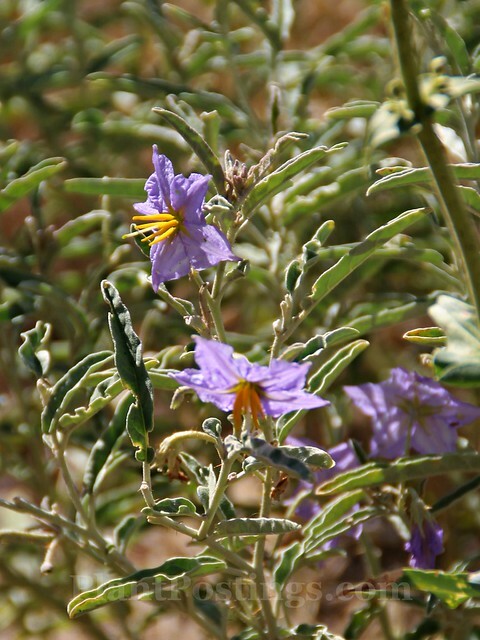 Silverleaf Nightshade (Solanum elaeagnifolium) is a North American native--from North Carolina and Florida, through the central Midwest and west to the Pacific states. These Opuntias and Yuccas form an attractive border near the parking lot. 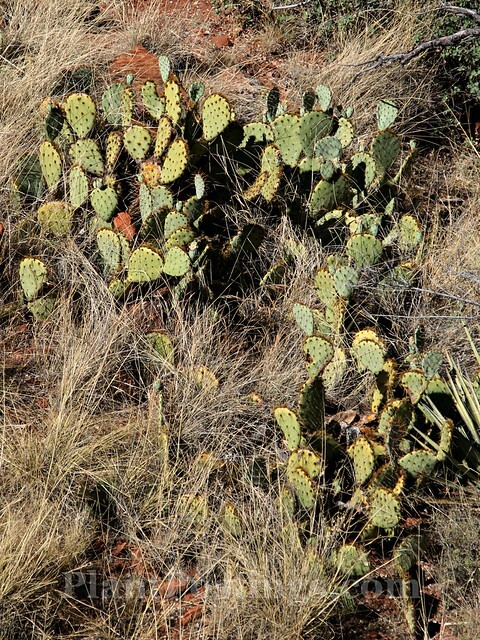 Large Opuntia cactuses are common in the Sedona area. 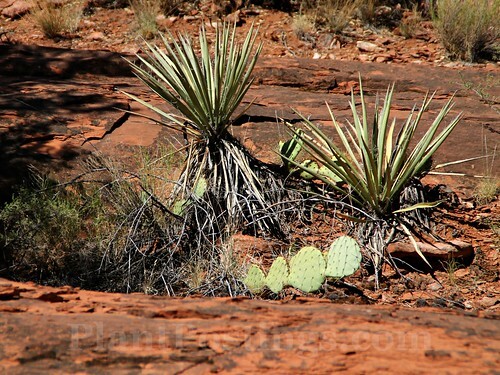 They grow in cracks and crevices with grasses along the ridges and indentations of the rock formations. 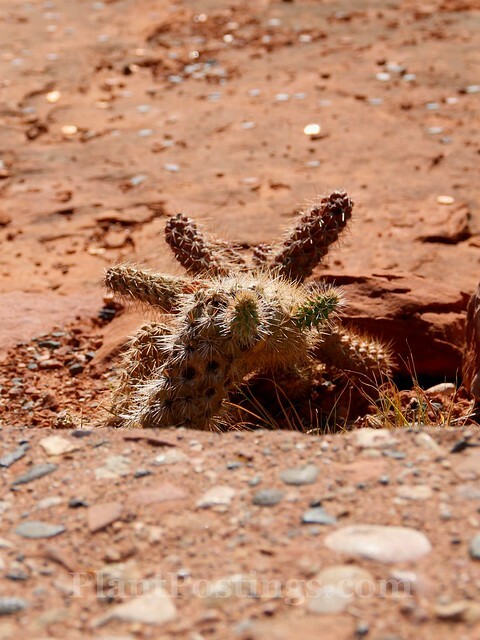 It's incredible how opportunistic little cactuses can be--putting down roots in very shallow indentations in the rock. 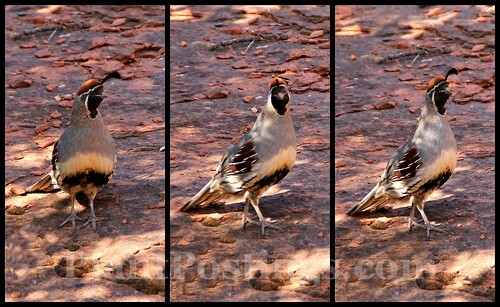 A Gambel's quail poses for candids. 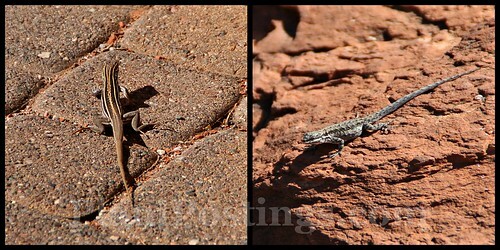 Lizards scurry to and fro. 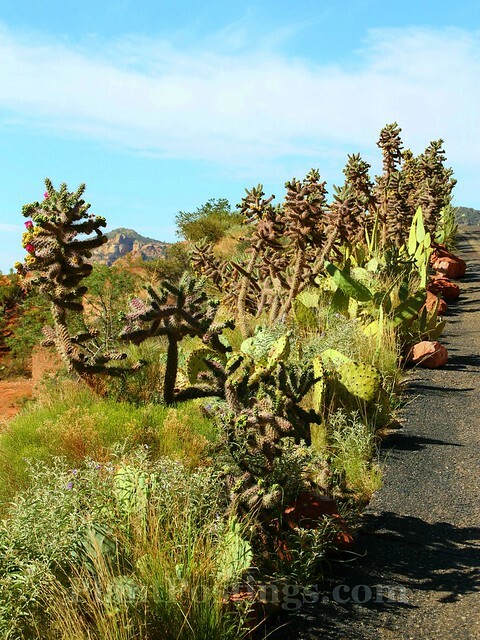 The path up to the chapel features an impressive stand of cactuses. 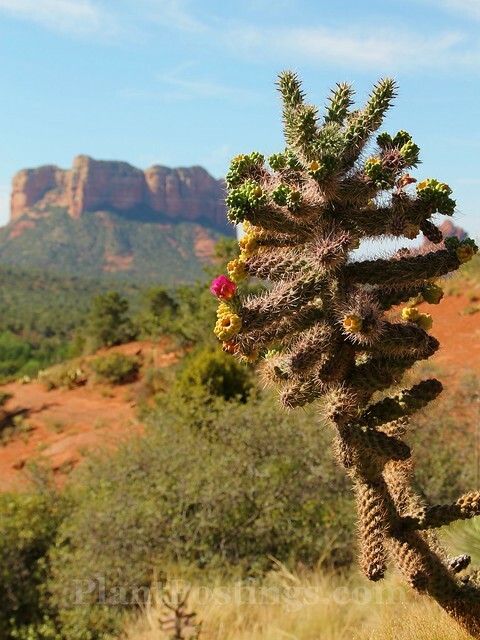 Cholla cactuses (Cylindropuntia spp.) in flower are dramatic. 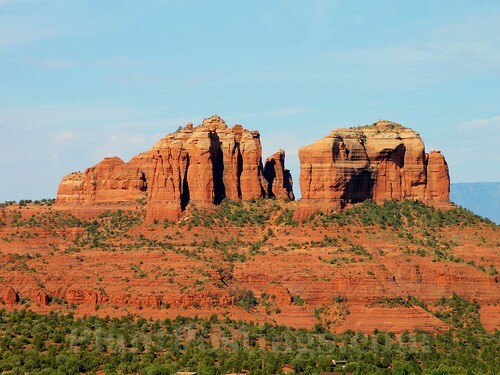 Many of the local famous Sedona rock formations are visible from the Chapel of the Holy Cross, but the angles are different than the traditional views more commonly photographed. 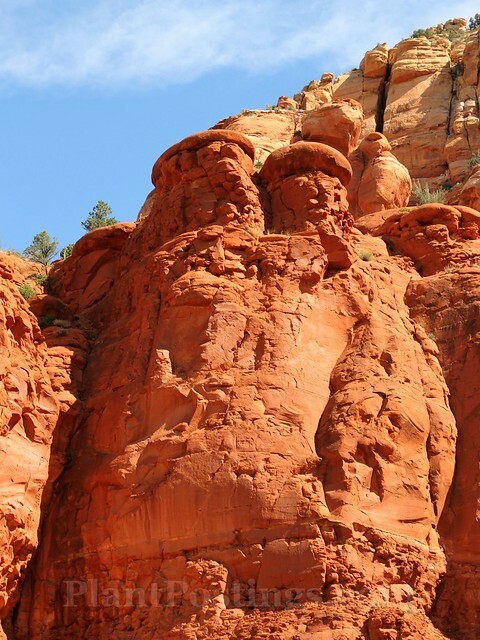 You can see the strata of rock along many of the ridges. These look like chimneys to me. 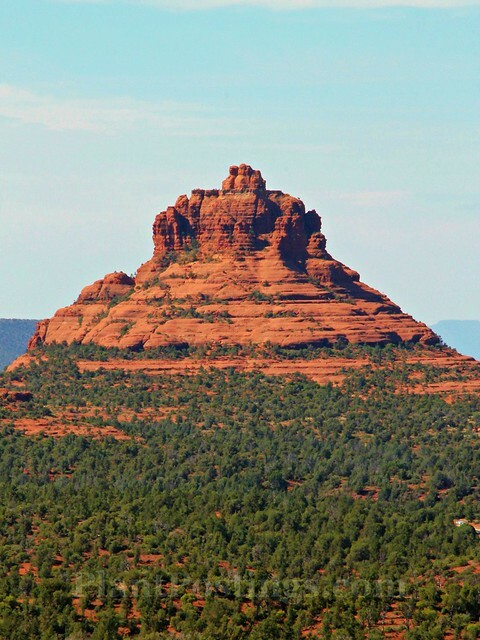 The color of the rock is striking and changeable, depending on the sun's angle at various points in the day.